The 20th general assembly of the FIUV (Foederatio Internationalis Una Voce) was held this past November 5-6 in Rome, and on December 19th the same issued their written report coming out of that general assembly. Within that context, there were a few presentations delivered which I hope to share with you here on NLM in the next few days as I am sure they will be of interest to many of our readers. 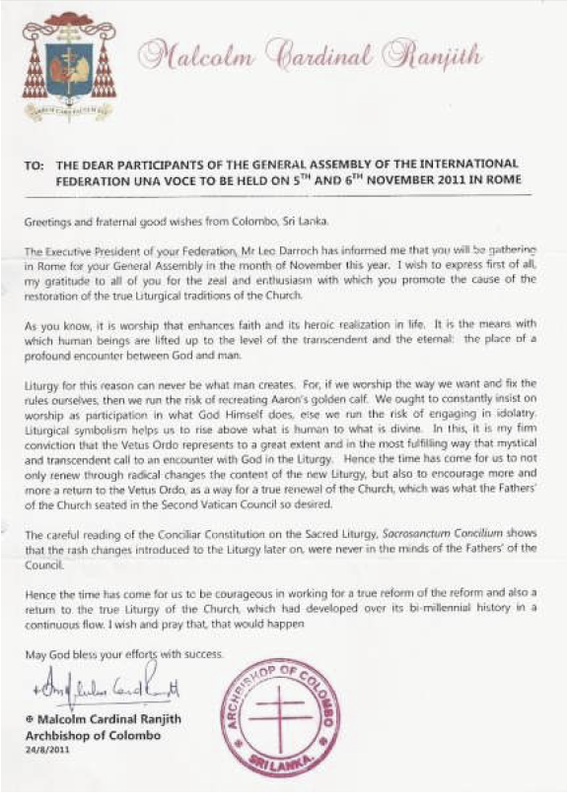 But before I do so, I wanted to share with our readers the contents of a letter which was written by Malcolm Cardinal Ranjith -- former secretary of the CDW -- to the participants of that assembly. I wish to express first of all, my gratitude to all of you for the zeal and enthusiasm with which you promote the cause of the restoration of the true liturgical traditions of the Church. Liturgy for this reason can never be what man creates. For if we worship the way we want and fix the rules ourselves, then we run the risk of recreating Aaron's golden calf. We ought to constantly insist on worship as participation in what God Himself does, else we run the risk of engaging in idolatry. Liturgical symbolism helps us to rise above what is human to what is divine. In this, it is my firm conviction that the Vetus Ordo represents to a great extent and in the most fulfilling way that mystical and transcendent call to an encounter with God in the liturgy. Hence the time has come for us to not only renew through radical changes the content of the new Liturgy, but also to encourage more and more a return of the Vetus Ordo, as a way for a true renewal of the Church, which was what the Fathers of the Church seated in the Second Vatican Council so desired. The careful reading of the Conciliar Constitution on the Sacred Liturgy, Sacrosanctum Concilum shows that the rash changes introduced to the Liturgy later on, were never in the minds of the Fathers of the Council. Hence the time has come for us to be courageous in working for a true reform of the reform and also a return to the true liturgy of the Church, which had developed over its bi-millenial history in a continuous flow. I wish and pray that, that would happen. May God bless your efforts with success.